This is a note from my daughter's soccer coach regarding winter training. I am sending this out to clear up some questions. I have been getting notes from confused parents on what to do over the winter months if anything. In this day and age we cannot stress enough how important it is to continue to train as much as possible at these younger ages. (The kids are 10 years old). These younger ages are when the kids develop the necessary skills (technical skills ) needed to play at a high level when they are older. Right now with our age groups the girls are focusing on ball control and individual ball skills (Basically the proper techniques needed to play the game at the next level) which includes High school. As you have all seen this year the U10 age group has already started to be introduced to the tactical side of the game, which is includes roles and positioning on the field , how to make runs , etc . We only train 3 hours per week, so as we start to focus on the team (tactical) there is not much time to spend on the individual player (tecnhical). The foundation must be built at these younger ages or your kid will only go so far before they hit a wall. All of our players are very talented and capable of playing at a high level as they get older. I know for some, this is all new and are not sure what direction to go. I have been in this for a long time now. I can tell you that players are made! They just don’t wake up one day as a great soccer player. It takes a long term investment and you will see the rewards. So hopefully that helps everyone understand how they can help their children be better at this sport , it is the training that will get them there. The best players play the game year round. 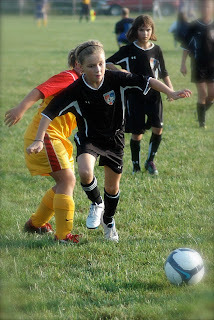 If your kid wants to play soccer in high school then they will need to play year round. Why because that's what all the other players vying for those few high school roster spots are doing. One caveat. I think that kids should play multiple sports at a young age. Lessons learned on a basketball court can help on a soccer field. Endurance gained on a soccer court will help a volleyball player. Muscles developed playing volleyball can help on a basketball court. Youth Sports Fanatics by Nature or Nurture?